As we drool over catalogs containing pages of colorful flowers – the problem is that most of these plants require full sun. That's a rare commodity for most of us who have small lots shaded by walls, trees and shrubs. Even gardeners fortunate enough to have large open spaces find many shady nooks and corners just crying out for cultivation. The fact that impatiens and begonias consistently rank among the five most popular annuals sold each year is evidence of this shady problem faced by most North American gardeners. Yet there are alternatives to these standard bedding plants. In fact, with a little planning, your shade garden can be as beautiful and interesting as your sun-filled garden. Here, we'll discuss basic techniques of shade gardening, including types of shade, methods for reducing shade, soil preparation, and maintenance. Next, we'll cover a selection of perennials for shady gardens. Jump straight to the best perennials for shade, or read on to learn about the different types of shade and ways to deal with them. Also see our chart of the best perennial ground covers for Dry Shade. First and foremost, all shade is not created equal. Areas with partial shade allow for a broad range of interesting and colorful plants, while deep shade, particularly dry, deep shade, such as that found under a massive oak or pine trees, severely limits the number of plants that will thrive. Understanding the type of shade you have and choosing plants for those particular light requirements is the single most important element of a successful shade garden. Dappled shade is created by a light canopy of tree foliage, a pergola, or a lath roof. A moving pattern of sunlight and shade across the ground provides direct sun for one or two hours a day, and the area receives bright, indirect light during the rest of the day. A wide range of plants, including woodland plants, will thrive in dappled shade. Not all trees produce dappled shade; evergreens and trees with dense foliage create deep shade. Light shade is often referred to as open shade, because the area is open to the sky, but walls, hedges, or other structures block direct sunlight. Even though there is no direct sun, the area still receives plenty of reflected bright light. Many plants will thrive in light shade, including vines and climbers that can be used to cover stark, unattractive walls and privacy fences. The soil in these spaces tends to be dry, as much of the rainfall is blocked by the structures. Generally, partial shade is defined as an area that receives two to six hours of sun each day. Many plants that prefer full sun will perform well in partial shade. Deep shade can be defined as an area that receives no direct sun, and has low light intensity throughout most of the day. These types of conditions can be found under an evergreen or in a recessed entryway. Although the number of plants that will grow in deep shade is small, a few will actually thrive in it. Shady areas along streams, ponds, or well-watered flowerbeds are moist shade areas. Shade loving plants that require consistently moist soil, such as maidenhair and cinnamon ferns, trillium, bluebells, and forget-me-nots, will thrive in these areas. Dry shade, such as the kind found under oak and eucalyptus trees, presents the biggest challenge for the shade gardener, as few plants tolerate both shade and dry soil. The trees rob most of the nutrients and water from surrounding plants, and their complex root systems make soil amendment difficult. It is possible to reduce deep shade to dappled shade under trees and large shrubs by pruning. Thinning out branches opens up the canopy, allowing more light to reach the ground and increasing air circulation. The tree on the right shows the "before" look, and the one below left shows a properly thinned out "after" look. Just as you would with roses, start by removing dead or diseased branches first. 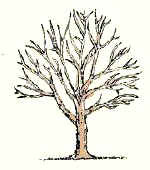 Then prune those that grow toward the center of the tree or shrub, rather than outward. Continue pruning selectively, until you achieve the desired amount of shade. Never prune more than one-third of the branches in one year. 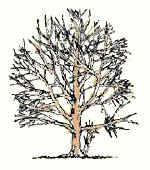 Try to remove small branches rather than major limbs. Removing the lowest branches will raise the tree’s canopy and permit more direct sun to reach the ground. Another option is the complete removal of large shrubs and trees, particularly if they are planted too closely together. This may be the only option in the case of trees or shrubs that drop leaves which are toxic to most plants, such as the eucalyptus or black walnut. Use paint and mirrors to add light. Walls and privacy fences that form the perimeter of a shady nook can be brightened by painting them white; this will reflect available light and visually brighten the entire area. Another technique used by ardent shade gardeners is the placement of mirrors on the garden walls. Mirrors reflect light and create an illusion of depth, a particularly useful trick in small gardens. The mirror should be suitable for outdoor use; select heavy plate glass with a waterproof back. It should have pre-drilled holes allowing it to be mounted to the wall using brass screws, which are buffered with plastic or rubber washers. Framing the mirror with a false-perspective trellis, false doorframe, or stone arch will create an illusion that the garden continues on beyond the wall. While proper soil preparation is vital for any type of garden, the soil in shade gardens often has even more deficiencies than soil found in open, sunny spaces. Trees, hedges, and shrubs rob much of the moisture and nutrients from surrounding soil. Walls and fences deflect rainwater, resulting in dry soil. A thick build-up of damp leaves in woodland areas can promote fungal diseases and infestations of slugs and snails. Poor, dry soil found in front of walls is best corrected by double digging, which means digging the flowerbed to twice the depth of the spade’s blade. Remove the soil and place it in a wheelbarrow or on a plastic tarp next to the planting bed. Then spread a thick layer of organic matter (i.e., compost, leaf mold, or peat) in the bottom of the trench, which will not only enrich the soil, but aid in moisture retention. As you replace the garden soil back into the trench, work in generous amounts of organic matter. Add fertilizer to the top layer (ten to twelve inches) of soil. Double digging is not only difficult, but most likely impossible, underneath trees due to their extensive root systems. The only option may be to loosen and amend the soil in small pockets, to a minimum diameter and depth that is twice the size of the plant’s root ball. Where possible, choose plants with shallow root systems that won’t compete with the roots of the tree. Adding organic matter to the soil will help it retain moisture, but plantings in competition with large shrubs and trees may require more frequent watering than other parts of the lawn. Plantings under eaves or in front of walls may also require additional water. Spreading a two-inch layer of lightweight, organic mulch around the plants will help retain moisture. Other areas of the shade garden will require less frequent watering, as the lack of direct sunlight reduces the rate of evaporation. A good rule of thumb is to water until it has penetrated four or five inches of soil. Allow the soil to dry out slightly before watering again. Shade plants need regular fertilizing, but their metabolism is slower than that of sun-loving plants, so choose a mild fertilizer, such as a fish emulsion mixture. Of course, azaleas, camellias and rhododendrons use a special fertilizer made just for these acid-loving plants. Shade-loving plants are generally more sensitive to spacing requirements than sun-loving plants. Planting too closely in a moist, shady environment reduces air circulation and promotes fungal diseases, such as powdery mildew. For the same reason, don’t allow decaying leaf litter, large pieces of bark, and other garden debris to clutter up the shade garden. Removal of this garden debris will also reduce the number of hiding places for slugs and snails. African Blue Lily (Agapanthus). Light shade to full sun, zones 6-10. Both deciduous and evergreen varieties are available. Agapanthus forms large clumps of strap-shaped leaves with rounded umbels of blue or white flowers growing on tall stalks. Water frequently when the plant is in bloom; remove flower stalks after blooms fade. Performs best in normal garden soil, but tolerates some clay. Astilbe (Astilbe). Light to dense shade, zones 4-8. Astilbe has tall plumes of white, red, or pink flowers that rise above glossy, dark green foliage. The plant prefers cool, moist, humus-rich soil, although it cannot tolerate wet winters without adequate drainage. Astilbe is a heavy feeder and can deplete the soil as years pass, so fertilize regularly. Barrenwort (Epimedium). Light shade to dense shade, zones 5-9. Barrenwort bears small, orchid-like or saucer-shaped flowers in red, pink, purple, yellow, or white from spring to early summer. The leathery, heart-shaped leaves often turn a bronze color in the autumn. Most species reach 12” tall. It prefers fertile, humus-rich, moist soil in shade, with shelter from cold, dry winds. For the best display of foliage and flowers, clip back old leaves in late winter or early spring before flower spikes emerge (the exception to this is E. perralderianum). Bear’s Breeches (Acanthus mollis). Light shade to full sun, zones 7-10. This striking, vertical plant has large, dark green leaves up to 36” long with tall, white and purple flower spikes reaching 3’ tall or higher. Although Bear’s breech prefers moist, fertile, loamy soil, it will tolerate dry, sandy soil. Remove fading flower stalks. This plant’s spreading root system can be invasive. Bellflower (Campanula). Light shade to full sun, zones 3-8. Many varieties of Campanula will perform well in light shade, such as C. alliariifolia (Ivory Bells), C. americana, C. ‘Burghaltii’, C. collina, C. ‘Elizabeth’, C. glomerata (Clustered Bellflower), and C. lactiflora (Milky bellflower). The bell shaped flowers are usually pink, blue, lavender, purple or white, and bloom from late spring to late summer. Most species prefer fertile, neutral to alkaline, moist soil. The delicate flower colors are best preserved in the shade. Tall species require staking. Cut back after flowering to encourage a second flush of flowers. Campanulas will self-seed given favorable conditions. Bethlehem Sage (Pulmonaria saccharata). Light shade to dense shade, zones 4-8. The plant’s dark green leaves are speckled with patches of white and form rosettes that grow 6-8” high. In spring, clusters of blue or white flowers appear on stalks 10-12” tall. Bethlehem sage prefers moist, humus-rich soil and requires little maintenance. Water during dry periods. Bleeding Heart (Dicentra). Light shade to full sun, zones 4-8. Bleeding heart has pendent, heart-shaped flowers in a variety of colors and attractive, fern-like foliage. It will self-sow if growing conditions are favorable, and most hybrids prefer moist, humus-rich soil, although D. chrysantha needs a dry, sunny site. Ingesting the plant can cause stomach upset. D. spectabilis (Bleeding Heart) blooms profusely in spring and then goes dormant in midsummer. D. eximia (Fringed Bleeding Heart) does not have a dormancy period, blooming in spring (although less abundantly than D. eximia) and then intermittently into autumn. Bugbane (Cimicifuga) Light shade, zones 3-8. From June to August, bugbane produces bottle-brush spires of white flowers that can rise as much as 8 feet above the foliage clumps, which can reach 3 feet. Native to woodlands, bugbane prefers moist, humus-rich soil. Cardinal Flower (Lobelia cardinalis). Light shade to full sun, zones 3-9. The cardinal flower bears tall spikes of bright red flowers from midsummer to fall. Although short-lived, it will self-sow where conditions are favorable. Cardinal flowers prefer moist, well-drained sandy loam that is humus-rich. Water frequently and mulch heavily to retain moisture if the plant is exposed to direct sun. Chinese Foxglove (Rehmannia elata). Light shade, zones 9-10. From spring to autumn, Rehmannia elata bears tubular pink flowers similar in shape to foxglove blossoms. The pendent flowers hang from branching stems, which can reach to five feet. Water freely during the growing season, and grow in moderately fertile, humus-rich soil. Where not hardy, lift roots before the first fall frost and pot up, overwintering in a cool, dry place where temperatures remain above 45 degrees. Columbine (Aquilegia). Light shade to full sun, zones 3-9. Delicate, spurred flowers in a variety of colors rise on tall stalks from 18” to 36” above light green, notched, compound leaves. Columbine prefers better than adequate drainage and needs cool, moist, humus-rich soil. It tolerates full sun only in cool climates. Coral Flower (Heuchera). Light shade, zones 3-8 (with the exception of H.versicolor for zones 8-10 and H. villosa for zones 5-9). Several small, tubular flowers in a variety of colors appear on tall stalks rising from mounds of heart-shaped, deeply veined, sometimes marbled leaves. Plant heights range from 12” to 30”, depending upon the species. Grow in fertile, moist, neutral soil. The woody rootstock grows upward; eventually the plant must be lifted and replanted in late summer or early autumn, with just the crown above the surface. Creeping Phlox (Phlox adsurgens). Light shade to full sun, zones 4-8. This creeping, semi-evergreen perennial is covered with a carpet of small, pink flowers in late spring and early summer. The plant reaches a height and spread of 12”. It prefers fertile, humus-rich, moist soil. Daylily (Hemerocallis). Light shade to full sun, zones 3-10. Daylily flowers come in a variety of colors and most types bloom for a period of three to four weeks, although several new hybrids have been cultivated to bloom all summer long, such as the Stella d’ Oro daylily. Some cultivars are evergreen in mild climates. Daylilies prefer average, well-drained, humus-rich soil. Too much fertilizer causes lush growth of foliage at the expense of the flowers. Hot sun can cause the flowers to fade prematurely; provide direct sun only in cooler climates. Deadhead to maintain a neat appearance. Elephant’s Ears (Bergenia). Light shade to dense shade, zones 3-8. Clusters of small, funnel-shaped, red, pink, or white flowers are produced in the spring on small stems that rise from the center of clumps of glossy, leathery leaves that are 6-12” long. The leaves often turn an attractive bronze in the winter. Most species of Bergenia reach 12-18” tall. It prefers humus-rich, moist soil and dislikes extreme heat and drought, but can tolerate some exposure and poor soil, which actually enhances the winter leaf color. Protect from snails and slugs. Evergreen Candytuft (Iberis sempervirens). Light shade to full sun, zones 5-9. Evergreen candytuft forms a foot high mound of glossy, narrow, dark green leaves and bears white, flat clusters of flowers from March through June. It may bloom again in the fall and winter in mild climates. Deadhead to encourage continued blooming. Candytuft tolerates any well-drained garden soil and prefers regular watering. Feverfew (Tanacetum parthenium). Light shade to full sun, zones 4-9. Feverfew is a low, spreading plant that is covered by an abundance of small, white, daisy-like flowers from July through August. Both single and double-flowered types are available; the single flowering type self-sows prolifically. The plant tolerates a variety of soils, but prefers sandy, loam soil. Although it will perform well in light shade, it blossoms most profusely in full sun. Geranium, Cranesbill (Geranium). Light shade to full sun, zones 4-9. This genus includes over 300 species, usually bearing white, pink, purple, or blue saucer or star-shaped flowers. Most geraniums prefer moderately fertile, well-drained soil, but will tolerate moist soil. Remove faded blossoms and leaves to encourage further production. Many geraniums cease flowering during very hot temperatures. Goatsbeard (Aruncus dioicus). Light shade to full sun, zones 3-7. Goatsbeard has tall, white plumes rising from dark green, shrub-like foliage. The plant grows 5 to 7 feet tall but does not require staking, and prefers moist, humus-rich soil. Globeflower (Trollius). Light shade to full sun, zones 5-8. These three foot tall bushy plants produce rounded, yellow and orange flowers in late spring and early summer. They thrive in moist, heavy, humus-rich soil, although you should avoid planting them in boggy soil. Deadhead to prolong blooming. Globeflowers prefer shade and can tolerate direct sun only in cooler climates and if kept moist. Golden Groundsel (Ligularia dentata). Light shade to full sun, zones 4-8. Golden groundsel bears numerous clusters of orange-yellow flowers on tall stalks from midsummer to autumn and can attain heights of 3-5 feet. The large, kidney-shaped leaves reach 12” wide. Give the plant moist, rich soil in light shade. High temperatures will cause the leaves to wilt. Golden groundsel cannot tolerate drought or soggy soil. Protect from snails and slugs. Hellebore (Helleborus). Light shade to full sun, zones 5-9. Hellebores bear long-lasting, pendent or cup-shaped flowers of various colors and have leathery, toothed leaves. Hellebores are especially effective when naturalized in a woodland garden; smaller species are ideal for rock gardens. Hellebores tolerate a range of moist, fertile, humus-rich soil. Most species prefer neutral to alkaline soil. All parts of the plant cause stomach upset if ingested. Protect hellebores from slugs, snails, and aphids. Japanese Iris (Iris ensata , syn. I. kaempferi). Light shade to full sun, zones 5-8. In June and July, the Japanese iris bears gorgeous flowers in white, blue, purple, or pink, on stems four feet high. The sword shaped foliage grows three to four feet and looks good all season. The plant requires acidic, humus-rich, moist to boggy soil. The Japanese iris will self-sow prolifically if it finds growing conditions favorable. Note: Irises can be divided into two groups: 1)Rhizomatous, which includes Bearded, Beardless, and Crested Irises, and 2) Bulbous, which includes Reticulata, Juno, and Xiphium Irises. While bulbous irises prefer full sun, almost any rhizomatous iris will perform well in light shade. Knotweed (Persicaria). Light shade to full sun, zones 3-8. Both annual and perennial varieties are available. Knotweed can be invasive, as the name implies, but it is an undemanding plant in the shade border. The plant bears spikes of long-lasting, cup-shaped, white, pink, or red flowers, which are followed by brownish red berries. Most varieties prefer moist soil, but P. bistorta will tolerate dry soil. This plant may cause skin irritation in some people, and ingestion will cause stomach upset. Lady’s Mantle (Alchemilla mollis). Light shade, zones 2-9. The attractive foliage has kidney-shaped, pale green leaves that may be pleated and have a fine covering of silky hair. The airy clusters of yellow-green flowers are long lasting. Prefers moist, humus-rich soil; deadhead to prevent prolific self-sowing; cut back and water for repeat flowering in autumn. Leopard’s Bane (Doronicum cordatum). Light shade, zones 4-8. Leopard’s Bane has bright yellow, daisy-like flowers that bloom abundantly above large, heart-shaped leaves. The plant will become dormant in the summer, so intersperse individual Leopard’s Bane plants with other plants that will grow quickly enough to fill in the empty space. The plant can reach three feet tall and spread quickly. The centers of the clumps die out and require division in the fall. Grow in moist, humus-rich, preferably sandy soil. Leopard’s bane will not tolerate drought. Lilyturf (Liriope). Light shade to full sun, zones 7-10. Liriope forms clumps of wide, dark-green, grasslike leaves up to 2 feet tall. Violet spikes of flowers appear from midsummer to fall, and are followed by dark blue berries. Liriope tolerates a wide variety of soils and needs only light watering during the summer. Marsh Marigold (Caltha palustris). Light shade to full sun, zones 3-7. Marsh marigold bears bright yellow flowers above rounded leaves, growing 12-18” high. It performs well in wet, soggy soil or standing water and blooms in the spring. The entire plant goes dormant by midsummer. The plant can tolerate drier soil with frequent watering and a generous layer of mulch. If grown from seed, the plant will not bloom until its third year. Meadowrue (Thalictrum rochebrunianum). Light shade, zones 5-9. During the summer, meadowrue produces airy clusters of lavender flowers on 3 foot stalks that rise from 18”-24” tall clumps of finely textured foliage. The plant prefers deep, evenly moist, humus-rich soil. Mondo Grass (Ophiopogon japonicus). Light shade to full sun, zones 7-10. Mondo grass forms clumps of narrow, curved, dark green leaves that are 8-12”long. In the summer it bears short racemes of white or lilac flowers, which are followed by blue-black berries. The plant prefers moist, slightly acidic, humus-rich soil. Protect new plants from snails and slugs. Plantain Lily (Hosta). Light shade to dense shade, zones 3-8. Hostas are grown primarily for their beautiful foliage – large, bold leaves that come in all shades of green and many different variegations. The flowers produced from July to October are spikes of lily-like flowers in lilac, mauve, or white. Hostas prefer rich, evenly moist soil, and can last up to 30 years in one spot. Protect from snails and slugs. Primrose (Primula). Light shade, zones 4-8. The Primula genus consists of 425 species that tolerate a variety of growing conditions. The dark greens leaves form basal rosettes, and have attractive bell-shaped flowers that may cluster together among the leaves, or grow on thick stalks in umbels or spikes. The blooming season lasts from late winter to midsummer in temperate regions. Flowers are available in a wide variety of colors. Primulas prefer evenly moist, rich soil. Purple Coneflower (Echinacea purpurea). Light shade to full sun, zones 4-9. Echinacea grows 3 to 5 feet high and blooms from July through September. Its flowers have purple, drooping petals that surround a dark brown, conical center. Native to prairies and meadows, the plant prefers sandy, well-drained soil. Provide light feeding and moderate amounts of water; light shade produces richer colors than full sun, which tends to fade the flowers. Protect from Japanese beetles, which can decimate the plant. Siberian Bugloss (Brunnera macrophylla). Light shade to full sun, zones 3-7. Siberian bugloss has abundant numbers of small blue flowers that cluster above large, attractive, heart-shaped leaves in the spring, reaching 12-15” tall. It will tolerate a wide range of soil conditions, but prefers moist, humus-rich soil. Solomon’s Seal (Polygonatum). Light shade to dense shade, zones 3-9. Solomon’s seal has attractive, long, arching stems (some types have variegated leaves) and bears pendent, bell-shaped, white, pink, or light green flowers along the lower sides of the stems. Grow in fertile, humus-rich soil. Although Solomon’s Seal prefers moist soil, it will perform well in dry soil, and tolerates root competition, making it a good choice to plant under trees that have shallow root systems. All parts may cause stomach upset if ingested. Protect from slugs. Trinity Flower (Trillium). Light shade, zones 5-8. The trinity flower has three dark green, glossy leaves to each stem, which bear white or pink flowers, each having three petals. Berries follow the flowers, and the plant height varies from 1 to 3 feet. Plant during the autumn in deep, rich, evenly moist soil. Protect from snails and slugs. Violet, Pansy (Viola). Light shade to full sun, zones 4-9. These five-petaled flowers bloom profusely all summer and may self-seed freely. They prefer fertile, humus-rich, moist soil. Deadhead to prolong flowering. Some vigorous plants may require you to cut back growth after flowering to maintain neat shapes. Virginia Bluebells (Mertensia pulmonarioides, syn. M.virginica). Light shade to dense shade, zones 3-7. During the spring, Virginia bluebells have light blue, pendent flowers that hang in clusters from branching stems reaching to 18” high. Give the plant evenly moist, cool, humus-rich soil. Allow foliage to die back naturally; bluebells will self-sow in favorable growing conditions. Wild Sweet William, Blue Phlox (Phlox divaricata ). Light shade to full sun, zones 4-8. This semi-evergreen perennial bears light blue and white flowers in spring. The plant reaches a height of 12” and spreads to 20”. It prefers fertile, humus-rich, moist soil. Windflower (Anemone). Light shade to full sun, zones 3-8. Open clusters of white or pink flowers are borne above large, deeply lobed leaves that resemble maple leaves. Although easy to care for, they resent any disturbance once established. Windflower grows from 2-5 feet tall and needs moist, humus-rich soil. Plants will tolerate full sun only in cool climates.